Instead of picking out a gown encrusted with rhinestones or accented with lace, Skyler Branch took a different route. Picking out a prom dress is a major high school milestone. 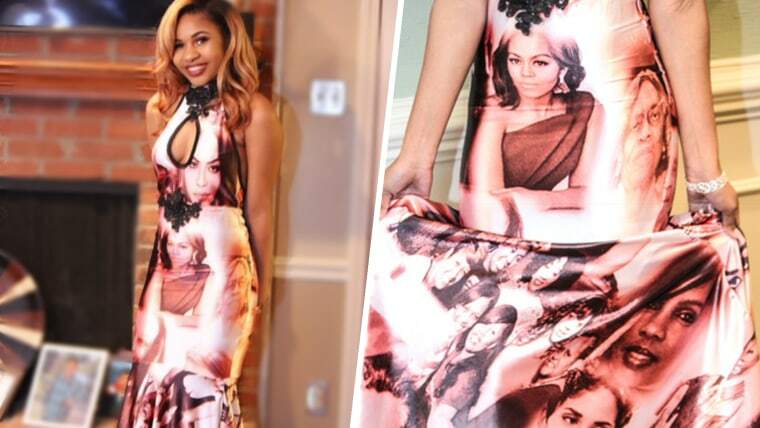 But one Memphis-based student, Skyler Branch, wanted to do something completely different: Instead of picking out a gown encrusted with rhinestones or accented with lace, she designed her own dress decorated with the faces of black women who inspire her. "I was inspired by a young lady in Florida who did a tribute to all of the police brutality victims on her prom dress last year, but I wanted to expand that idea further and base it off of the women who inspired me in my life. Not even just famous people or famous women, but the women in my family who have done so much for me," Branch told TODAY Style over the phone. Shannon Pierce, a seamstress in Mephis, brought Branch's dream dress to life, with the final product featuring famous faces like Oprah, Aaliyah, Michelle Obama, Maya Angelou, Halle Berry, Harriett Tubman and Rosa Parks. "It was an honor and pleasure creating this beautiful piece which included strong black women!" Pierce wrote on Instagram. "She said she wanted to take them all to prom with her and i think we did just that." In addition to recognizable names, Branch's dress also included women in her family who inspire her, like her great grandmother, grandmother, aunts and her mom, Dayna Branch. "The women who go unknown to a lot of the people outside of celebrities, like myself and my grandmother, we're just as important to Skylar as Michelle Obama or Beyonce because at the end of the day, we started the generation," Dayna Branch told TODAY. "So for her as a young woman to say, 'You know what, I want to put all the women who inspire me on her dress,' that's something major. And then to see my own face on her dress!" She said she wanted to take them all to prom with her and i think we did just that. The 17-year-old kept her dress a secret until prom night and says her peers were "shocked" when she walked in. Her step team met her outside of the event with flashlights and helped her make a grand entrance. "All eyes were on me," Skylar recalled. "They had to (do a) double take, because they saw the dress but at first didn't realize that I had faces on it." People were stopping her all night to check out who was being celebrated and lauded the dress as "different" and "unique." The dress has since gone viral on social media, with commenters applauding Branch's creativity. "Best prom dress on the planet," wrote one user. "Is she taking orders???" asked another. Taraji P. Henson and Toni Braxton "liked" her Dad's Tweet and both Aaliyah's aunt and Dr. Alfrieda J Webb's granddaughter saw photos of the dress and thanked Branch for paying homage to their late family members. Now that Skylar's prom has passed, she has some advice for other young women prepping for their own. "If you have an idea and you think it's too out of the box, if it's special to you, you should still do it," she said. "You shouldn't care what other people think."